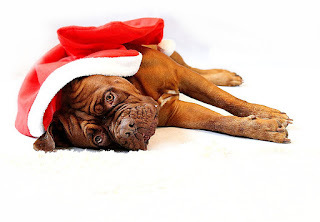 Santa, All I want for Christmas is that all dogs have a loving home! I wish that all dogs all over the world have a loving home! No place too near of too far to be beyond the reach of this wish. All dogs to be viewed for loving sentient beings that they are. All dogs to be treated fairly and not judged on false information or based on their looks. It's almost Christmas and whether you celebrate Hanukkah, Kwanza, Christmas or any other holiday or don't celebrate any at all, the holidays are all around us. There are so many dogs that are not fortunate and don't have loving homes, family, and are alone in cold cages some on death row, for nothing that they have done. Some are there because of ignorant biases, being judged based on their looks or some other factor that is not accurate. My focus this new year to do more to help the cause. I'm sharing on Facebook, I reach out to people and connect with people on behalf of the dogs in need, in danger. and in trouble. Donating to non kill shelters or rescues that pull dogs in bad situations from kill shelters. Offering products on line for sale and donating ten percent to the cause. I think adopting is wonderful and everyone should research the general specifics about a certain breed or mix if considering a particular dog. To interview the dog and to know if the dog is high energy, likes other dogs, kids and make sure that the dog is a match to your life. In my opinion, having a dog come into your life is a serious commitment. There is nothing like a dog in your life, it can be a wonderful experience and very rewarding. My dream would be to have a "hotel" for dogs that feels like home. For those dogs that don't have homes to provide long term (if needed) housing in an atmosphere that feels like home. To be able to provide everything they need including medical care. Please consider what each of us can do, even one small action can make a difference. Spread the love, joy, and hope. Rescue Love and Happy Holidays!